Developed by a Competitiver Racer and Race Committee Volunter, Yacht Scoring was developed to be easy and quick to learn, simple yet powerful and fully featured for all your Race Management needs! Having competed and worked with many race committees at various events for many years, we have learned what works, what doesn't and what the organizers and competitors really want - an easy to use Race Management Program and fast results! 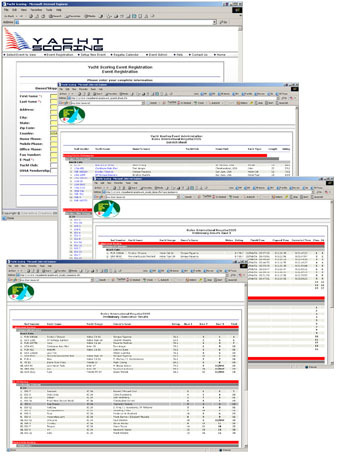 Yacht Scoring is a featured packed 100% web based Yacht Racing Management and Scoring system that simplifies the task of competitor registration, event management, competitor and media communications while providing complete results in near-real time to competitors and the Sailing World following your event on the internet. And with Yacht Scoring's quick and easy live scoring program, your event results are immediately available online as soon as finishes are entered! No more waiting and uploading files! Handle your scoring from the Race Committee boat and you'll have your results done before you return to the dock! And most important... You get all of htese featured with absolutely No Advertizing! Your sponsor's get priority and you can display their logos and links on all event pages! Let's get started!! Contact us and your event can be up and running with a complete Event Web Site and full Race Managemetn System in 5 minutes! Copy of your competitor's data for club use. We plan on adding others so if you have a specific handicap system you require in your event, local sailing area or country, please let us know so we can add them to the systems. We can be reached at support@yachtscoring.com. 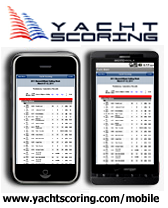 With Yacht Scoring online system, the possibilities are endless. Click here to contact us and start using Yacht Scoring to manage and score your event.